In August 2008 I went to Bolivia with e3 Partners. e3 works with pastors of local churches to train church members to invite people in their community to follow Christ. Part of this is the North American teams, who lead teams of local believers to spend a week talking to people in the neighborhood. One of the nice things about e3 is their value of not just preaching the Gospel, but of working to disciple people. Matthew 28:19 says “go and make disciples of all nations...”; it does not say “go and make converts.” Our goal was not to convert people, but to train the local believers to go and make disciples. We worked in the province of Beni, in the capital city of Trinidad. We flew into Santa Cruz, took an overnight bus through Beni, and arrived in Trinidad twelve hours later. Trinidad has periodic floods, and there is a ring around the city that doubles as highway and levy. The past two years have seen heavy flooding in the area. The area is quite poor. 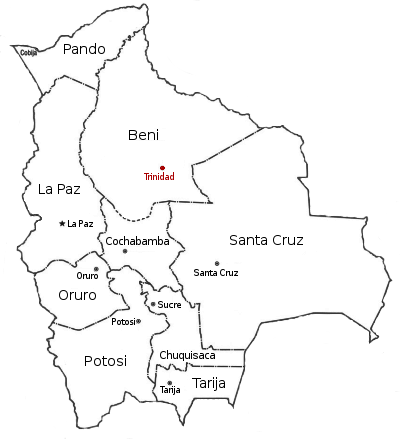 Bolivia is the poorest nation in South America, and while Beni is one of the wealthier eastern provinces, it is still quite poor. The part of Trinidad where the church my sub-team worked at probably qualifies as a slum; it was noticeably poorer than our hotel area. Bolivia has a history of political unrest; until the 1980s, there was a revolution on average more than once a year. Several years before we went, the eastern provinces had voted for “Autonomia, Si!”, that is, relative independence from the socialist-leaning Evo Morales central government. While we were there, they had protests in Santa Cruz which resulted in a couple deaths, and we left rather hastily on the last day as it appeared that they might be setting up road blocks, as people were burning things in the middle of the highway out of Trinidad. Several weeks after we left, the situation got so bad that American Airlines halted flights to Santa Cruz for about a week. Despite this, however, the people are friendly and open. Centuries of Catholicism have done a lot of pre-evangelism: pretty much everyone believes that God exists, that Jesus is God, and that we have sinned and deserve punishment. Somehow, the meaning of Jesus’ death, that he was punished for our sins, instead of God punishing us, was not communicated. Many times all that is necessary for a person to become a follower of Christ is simply to be told. This is quite unlike many areas of the world, including the U.S., where many people are not convinced that God even exists, let alone that our sin is serious enough that someone has to die for it. One of the families that prayed to received Christ. Much of what we did was going up to the gates of people’s homes and sharing the gospel. If I was doing the sharing, my translator would introduce me as from America, I would tell them what God has done in my life, and ask if I could ask them some questions about their spiritual life. If they said “si,” as they always did, I would go through one of e3's tracts, which has a number of questions to lead one through the Gospel. If they were Christian, or accepted Christ, I would ask for prayer requests and pray for them. As much as possible, though, I tried to have the Bolivians do the talking. Although missions trips are usually about the missionaries doing the work, with e3, our main task was to was to train the Bolivian church members to do evangelism. We could do a lot of evangelism in a week, but after that, we are gone. The Bolivians, on the other hand, will always be there. So our task was to model evangelism and discipleship to the Bolivians and to train them to do likewise. We generally had different church members each day, so training was a little hard. Some had already been trained in the evangecube, so if they were willing, I had them share right away, otherwise I did it first a time or two. As we were walking to the next house I tried to give some pointers on things that might help them. Since we generally did not have anyone who had done discipleship, with us the previous day, I generally modeled the discipleship, but then spoke about the importance and purpose as we were walking to the next location. Musical chairs at one of the evening meetings. We had three evening meetings, which were quite different. Before the first one, the power went out. We prayed for the power to return, but while we were waiting, we sang childrens’ song in front of the church with the kids who had come out. By the time the power come on ten minutes later, we had about twenty or thirty kids (no adults), so we did more kid’s stuff. The meeting on Tuesday was a regular church meeting, but we organized it. Andy read through a gospel tract, then I think I spoke briefly (and forgettably, since I have no idea what I did), then Ky, a teammate from another group, spoke about why we need to join a community of believers. This was good, since we had a few of the people we talked to that evening. The third night, Andy split off with the children, and I took the adults. There were a number I did not recognize, and I was not sure if they were church members, so I assumed that we might have some who were new. So I demonstrated briefly how to use a Bible (a point Ky had suggested to do when we give out Bibles) and went through the first little bit of the discipleship materials. I also went through the back of the evangecube, and spoke briefly about the importance of loving God and each other, reading the Bible, praying, being part of a church, and telling others. It turned out that everyone was a church member, and I think I took too long because a lot of people looked kind of bored at the end, but I hope God used it to model how to do basic discipleship. One of our goals was to follow up with people who accepted Christ and to disciple them. I generally gave a copy of the New Testament that we had, explained how to use it, mark and suggest that they read the gospel of John. I then went through the first couple questions of the discipleship sheet we had (a basic Bible study on salvation) in order to give them an idea of how to do it and to get practice looking up verses in the Bible. If we had nationals who felt comfortable, I had them do it (this only happened once, but she was really good). After a few questions, I left the sheet with them to do on their own time. Once in a while they had questions or concerns which we answered. One of the gals we visited had been told that she would sacrifice rewards in Heaven if she was not Catholic. This was kind of hard to answer, because I do not actually know official Catholic doctrine, but I pointed out verses that explained that salvation is believing that Jesus died for our sins and turning from them (Raul helped a lot here, too), and it seemed to answer her question. Discipleship was definitely an area I struggled with, because I did not really know what a new Christian needs to grow, and the discipleship material seemed really basic to me. Of course, just because it seems basic to me does not mean it is basic to everyone, though. My major struggle is probably knowing the principles of what they should be learning, and also the skill of being able to lead them there without just telling them. Unlike the U.S., we were able to share the gospel to a lot of school children. On one of the streets we were doing evangelism on, there was an elementary school. Raul wanted to share the gospel with them, so we went up to the front door, asked the teachers if we could, and they brought all the kids into the front room. So Raul shared the gospel with the eternity bracelets, which we then gave to all the kids. I think it was the next day that the entire North American team went to a private school, formerly Catholic but with an evangelical headmaster. Each of us took a classroom and went through the gospel. I chose the evangecube because it’s more exciting and integrated my testimony, so that it was not just some theoretical ideas. It went something like this. Afterwards, Raul lead us in a group prayer, with those who wanted to praying with us. He then had those who had prayed to come to the front and write their name down on a sheet of paper, which was then given to the headmaster. We also got a chance to chat with some of the kids (who, in our case, were seniors). One of the churches that e3 had partnered with in a previous year was having their 15 [?] year anniversary. So our entire team went to celebrate with them. It was much like a celebration at Austin Chinese Church: worship, a brief message by Pastor Enzo, different groups that had been involved with the church did a musical number (our performance was quite ad hoc, as we had no idea that we were going to be asked to perform), and then refreshments. The peanut drink was made by boiling peanuts, so it was safe to drink and I had some. Interesting flavor, with an almost citrus taste, but with a strong, yet mild, taste of peanuts.